Next year, the Michael B. Enzi STEM Facility is scheduled to open and play an important role in the University of Wyoming’s Science Initiative that focuses on active learning. Two UW professors are already ahead of the curve. For the past five years, Daniel Dale and Chip Kobulnicky have been teaching physics in a new way -- in a course that is a hybrid of lecture, lab and discussion. 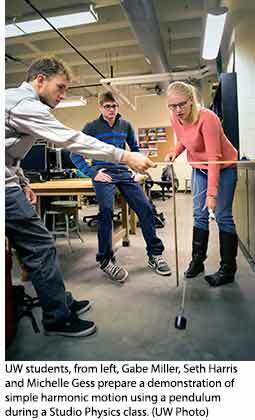 They call it Studio Physics and say the interactive approach has improved class attendance and increased learning; bolstered retention rates in physics classes; and cut down on office visits from students seeking extra help. 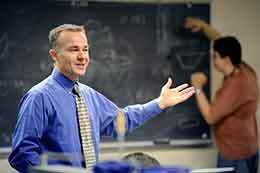 The Studio Physics 1210 course is calculus-based and for beginning scientists and engineers. Traditionally, the course included three hours of classroom lectures; students met once a week for a two-hour lab and another hour for discussion. With the new format, the Studio Physics class only meets three times per week for 100 minutes and is highly interactive, Kobulnicky says. Rather than be seated in long rows, students sit at round tables in small groups of four to six. Each table is equipped with two computers. In the Enzi STEM Facility, the room also will come equipped with white boards so that students can get up and make the class more interactive. “It’s more fun for me. I get to interact in class. I get to know all of the students,” Kobulnicky says. Dale, who teaches the Studio Physics 1220 course, has experienced the same. Students work in groups of three to four at least half of the time to solve problems and conduct experiments. Elements of demonstrations, labs and group problem solving are interspersed throughout the class period. Kobulnicky says attendance in the class tops 90 percent, compared to about 75 percent for other lecture-style classes. Student learning has improved by 50 percent compared to lecture classrooms, and numbers have been verified through standardized assessments, he says. The Science Initiative plan, developed by the Wyoming Governor’s Top-Tier Science Programs & Facilities Task Force, along with a team of UW science faculty members, calls for programmatic and facilities improvements in two phases, starting in 2015 and concluding in 2021. It emphasizes collaboration among multiple disciplines by assembling researchers into a single complex with shared instrumentation, technical support and collaboration spaces. The plan signals a dramatic change in the way the foundational sciences of botany, zoology, molecular biology, chemistry, physics and astronomy are taught at the university, moving from traditional lectures and laboratories to the active-learning format used in the Studio Physics courses. In addition to the Enzi STEM Facility, the plan proposes construction of a suite of active-learning classrooms -- to be part of a new science building constructed between UW’s Physical Sciences Building and Biological Sciences Building. To transition to active learning, the plan calls for robust training and mentoring programs for science department faculty members, along with more research opportunities for students through enhanced faculty mentoring, training programs and internships. Kobulnicky says the course format change is in response to research about physics education about how other students effectively learn physics. Small campuses, such as Colorado College and the Colorado School of Mines, teach courses similar to Studio Physics, Kobulnicky says. “At UW, we can combine the best personal attention characteristics of a small college with the resources of a big state university,” Kobulnicky says. He recalls his own undergraduate student days, sitting in a large lecture hall with 250 students. Kobulnicky says he did not meet or work with anyone in that class during the entire semester. “That’s no way to learn physics,” he says. He surmises some faculty members might think teaching a class in this fashion may constitute more work. But Kobulnicky has found it is actually less work because he doesn’t have to prepare a teaching assistant (TA) to run the class and he spends less time working with students outside of class. Similar comments were made in a report the previously referenced task force recently submitted to Gov. Matt Mead. “I think the Studio Physics course will be a feature of the Science Initiative and we will have more of these classrooms in buildings on campus,” Kobulnicky says. When the Enzi STEM Facility opens next fall, Kobulnicky envisions the course expanding from 33 students to 54 per class. In addition, he sees two course offerings -- up from one -- for both Studio Physics I and II per semester. He and Dale will continue to teach sections of the course. -- Students in traditional classrooms are 1.5 times more likely to fail a class than students in active-learning classrooms. -- Students score significantly higher on in-class exams and concept inventories with active learning, leading to increased course grades. During a late November session, students in Kobulnicky’s class gave a thumbs-up to the interactive classroom approach. For example, he says Kobulnicky can demonstrate the concept of periodic motion by using a visual of a grandfather clock. Logan Jensen, a freshman astronomy and astrophysics major from Greybull, agrees. Gabe Miller, a freshman from Casper double-majoring in astrophysics and mechanical engineering, says he enjoys working in small groups with fellow students. “I guess it’s easier to make mistakes and learn with your peers than put yourself out with a question in front of the class and the professor,” he says. Kobulnicky says he intentionally mixes up the student groups so they meet more students in the class and develop a broader base of friends with whom to do their homework. Michelle Gess, a sophomore geology major from Denver, says the combined format has made it easier to meet classmates and set up study times. 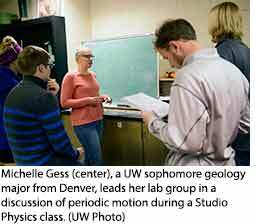 “She and I do homework together and study for tests, at least once a week,” Gess says, nodding in the direction of Danielle Badger, a sophomore electrical engineering major from Phoenix, Ariz.
“Since your lab is with the same professor who teaches the material, your lab actually relates to what you are learning in class,” says Badger, who has experienced courses in which one teacher taught the class and someone else ran the lab. During Kobulnicky’s recent lab portion of class, he presented students with a task of creating a single pendulum and predicting its period. Cody Minns, a UW master’s student from Laramie majoring in astronomy, serves as the course’s graduate assistant. Minns, who received his bachelor’s degree in physics and astronomy from Indiana University, says he wishes he could have taken Kobulnicky’s course when he was a freshman. Emily Gamboa, a senior at Laramie High School, takes the course for college credit. And that is the intent. Dale admits a 100-minute session is pretty long, so it’s important to keep students active and mix things up between theory and experiment.